Formally restricted to the South, this insect is now a serious problem on Brassica crops in southeastern New England. 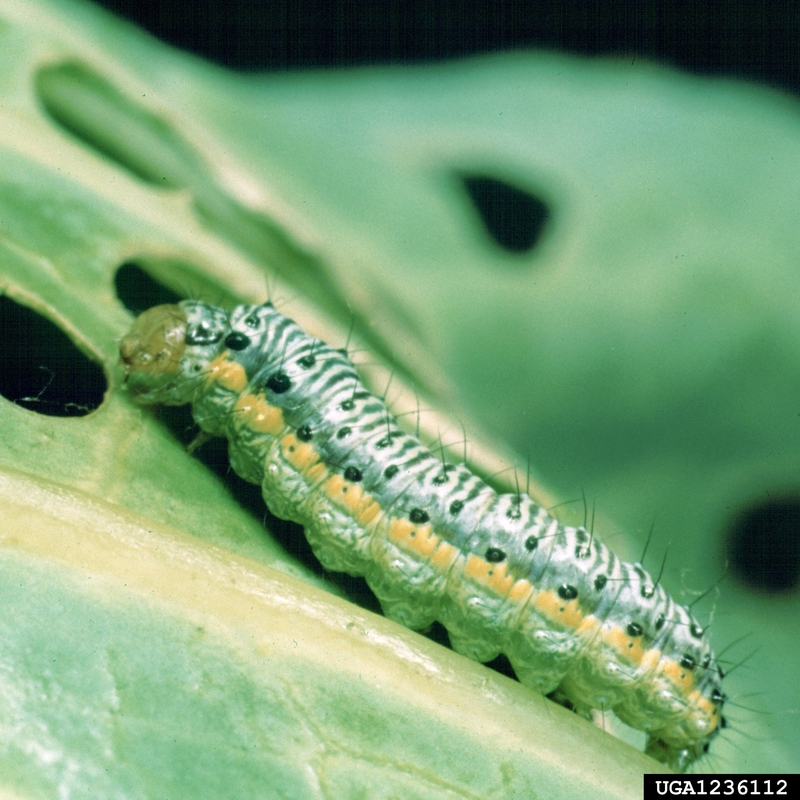 Unlike the three major caterpillar pests on Brassicas, the cross-striped cabbageworm (CSC) lays its eggs in batches (3 to 25) rather than singly. Egg batches are yellow, flattened, and attached to the lower leaf surfaces. Larvae grow to 3/4"-long in 2 to 3 weeks. The caterpillars are light bluish-grey on top and green underneath, with numerous black bands across their backs and a yellow line down each side. It has 2 to 3 generations per year and is most abundant on late-season plantings. Larvae produce small holes in leaves until only veins remain or target terminal buds and sprouts or may burrow into heads. Plants with larvae are often completely skeletonized. Adjacent plants may be left undamaged. Spray if 5% of the plants are infested with Cross-Striped Cabbage Worm. Use selective insecticides to preserve parasitic wasps. Plow under debris after harvest and control wild mustard and Shepard’s purse to help minimize pest population.